Neo-Hebraic poet; died in Palestine Nov. 25, 1624. He was the first ḥazzan of the first synagogue erected in Amsterdam, and occupied the position fourteen years, then removed to Palestine. He edited the work "Imre No'am," containing religious poems, hymns, and elegies (Amsterdam, 1628). Several of his Hebrew poems are to be found in the manuscript collection "Ḳol Tefillah we-Ḳol Zimrah" of David Franco Mendes. 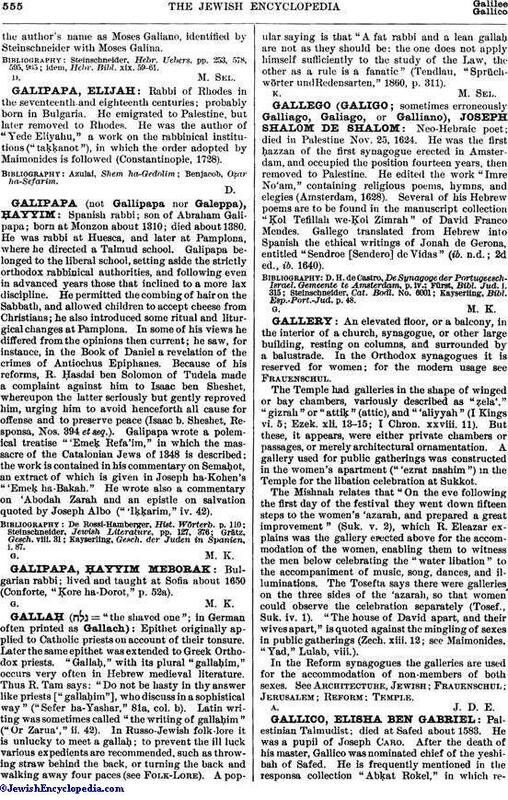 Gallego translated from Hebrew into Spanish the ethical writings of Jonah de Gerona, entitled "Sendroe [Sendero] de Vidas" (ib. n.d.; 2d ed., ib. 1640). Kayserling, Bibl. Esp.-Port.-Jud. p. 48.